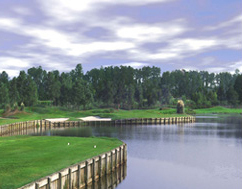 Players of all abilities will enjoy Oak Harbor’s scenic and exciting championship layout. Oak Harbor’s par 72, 6885 yard layout is sculpted from some of the most beautiful land in our bayou area. Opened to critical acclaim along with a nomination from Golf Digest as “America’s Best New Course” in 1992, Oak Harbor has done nothing but improve ever since. At Oak Harbor, practice amenities are a priority, not an afterthought. Our facility compares favorably with the best in the nation. The range has tees on both sides to take advantage of changing wind and sun conditions, while our putting green is 9,000 square feet of finely maintained Bermuda grass. Short game enthusiasts will also enjoy our two separate chipping greens and a sand trap that will help shave strokes frThe Clubhouseom your score.